Herbert Spencer (April 27, 1820 – December 8, 1903) was a renowned English philosopher and sociologist known for applying evolutionary theory to the study of politics and ethics. He coined the term "survival of the fittest" before it was used by Charles Darwin. Although considered a radical at the time, Spencer was a close contemporary of many famous philosophers and scientists such as Darwin, John Stuart Mill, and Thomas Huxley and became highly respected during his lifetime. His writings were both controversial and highly popular, and his "classical liberalism" had a notable influence on twentieth century politics and economics. Spencer prided himself on having developed insights into systematic social development that did not include the positing of a transcendent divine being. Spencer's views contributed substantially to the emphasis on self-interest as a core human value (without the provision for "sympathy" or concern for the other found in the writings of Adam Smith) and to the notion of racial superiority based on Spencer's understanding of the evolutionary development of humankind. 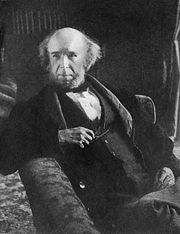 Herbert Spencer was born in Derby, England on April 27, 1820, the son of William George Spencer, a respected school teacher. He was one of nine children born, but the only one to survive childhood. Coming from a family of teachers, he was encouraged to learn at an early age. He studied biology and mathematics, but did little reading. During his childhood he was exposed to the many academic books and journals of which his father made use and was greatly influenced by his father's individualistic and anti-clerical views. When he was 13 his father sent him to live with his uncle, the Reverend Thomas Spencer, who could provide him a more formal education. Herbert developed some of his earliest political and economic ideas in response to his uncle Thomas’s radical reformist views, including protests against the Poor Laws that mandated governmental support for the poor, and the Corn Laws that taxed grain. In 1836 when he was 16, his uncle obtained for him a job as a civil engineer on a railway, an experience that deterred him from pursuing a future in professions where he felt bosses exploited the labor of overworked staff. More notably, Spencer began committing his thoughts to paper during this period, and upon visiting his uncle some years later at the age of 22, he was encouraged to send a number of letters on politics to a radical newspaper called The Nonconformist. This was the beginning of his involvement in both journalistic media and socio-political rhetoric, and the letters would later be published at Spencer’s expense as "On The Proper Sphere of Government." These early works demonstrated a liberal view of workers' rights and governmental responsibility. He continued in this vein by developing a rationalist philosophy concerning the natural laws of progress. These views would mature into his 1851 manuscript Social Statics, a document that stressed the importance of looking at the long-term effects of social policy with respect to the nature of man. It was here that Spencer began developing his view of civilization as a natural and organic product of social evolution rather than an artificial construct of man. After a five-year stint as sub-editor of the London financial paper The Economist that ended in 1853, Spencer began investing all his time towards writing professionally. In the following years he would produce works on philosophical and sociological topics such as education, science, the railway industry, and population explosion. In 1852 he wrote an essay "The Development Hypothesis" that set forth his views on evolution of species, by the "continual modifications due to change of circumstances." In 1855 Spencer wrote the Principles of Psychology, which explored a theory of the mind as a biological counterpart of the body rather than as an estranged opposite. In this model human intelligence is something that has slowly developed as a response to its physical environment. Such an evolutionary standpoint on the origin of man alienated conservative publishers, once again leaving Spencer to publish his work at his own expense. During the writing of Principles of Psychology Spencer traveled about Wales and France, and it was during one of these trips that his health underwent a decline from which it never fully recovered. Although it could not be said exactly what was wrong with him, Spencer suffered from a constant tiredness that made his sleeping patterns short and erratic and prevented him from long periods of work. While he blamed stress and the possibility of having underdeveloped lungs, the continued deterioration of his health in later years was likely the result of a growing dependency on morphine and opium. Despite his growing weariness Spencer continued to write, and in 1858 he began work on a large project that would cover his entire philosophy on evolution and the laws of progress. He wished to publish the work incrementally so that he could maintain a prolonged livelihood from its composition, but again he was unable to secure a publisher in any of the regular press. Fortunately, by this time, Spencer had endeared himself to the intellectual community of England, and a list of private subscriptions to his theory funded his living expenses and his work. Amongst these intellectuals was Thomas Henry Huxley, another prominent English philosopher who would remain a close peer of Spencer throughout his life. It was Huxley who included Spencer in the X Club, a dinner club group that met regularly and included some of the most prominent thinkers of their society (a number of whom would become president of the Royal Society). Members included philosopher John Tyndall and banker/archaeologist Sir John Lubbock and often entertained guests such as Charles Darwin and Hermann von Helmholtz. Through such associations Spencer had a strong presence within the heart of the scientific community and was able to secure an influential audience for voicing his views. In 1862 Spencer was able to publish First Principles, an exposition of his evolutionary theory of the underlying principles of all domains of reality (the foundational belief of his previous works). He defined evolution as the ongoing process by which matter is refined into an increasingly complex and coherent form. This was the main canon of Spencer’s philosophy, a developed and coherently structured explanation of evolution that predated Darwin’s major works. By this time Spencer was achieving an international reputation of great respect. His views on man's place in nature were very influential and broadly accepted. While he had an interest in all the sciences, Spencer never committed his time to a single field of study and was not an experimentalist. Perhaps this broad range of knowledge and lack of specialization made his views and writing so accessible and popular. His X Club name was Xhaustive Spencer, denoting the depth to which he would explore a given topic once committed to it. However he was always shifting between projects, making the influence of his work diverse and far reaching. In his sixties Spencer’s health continued to decline, and he became increasingly invalid. In 1882 he attended the funeral of Charles Darwin, breaking a rule of his never to enter a church. In 1884, his work Man versus the State was published, outlining his political philosophy. In 1902, shortly before his death, he was nominated for the Nobel Prize for literature. He continued to write throughout his life, often by dictation in his later years, until he succumbed to his poor health at the age of 83. 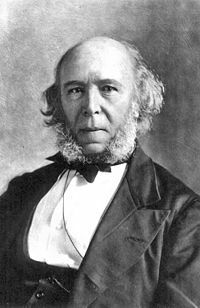 In his writings, Herbert Spencer attempts to create a system of human ethics based on the idea of natural human progress. He sees progress as something innate in human beings that happens over the course of time and in response to a changing environment. The end goal of this progress, says Spencer, is overall human happiness and prosperity, namely, the surplus of pleasure over pain. In Social Statics Spencer stresses that this evolution is not something that can be simply imposed on an individual by the state or any outside force. Thus, one of the most important factors to human development is the free exercise of natural human faculties. Spencer believed that the first principle of ethics was "the law of equal freedom" which states that "Every man has freedom to do all that he wills, provided he infringes not the equal freedom of any other man." He believed that each person possesses a moral sense to not hurt others in the pursuit of their own happiness and that individual freedom naturally leads one to respect the individuality of others. In The Principles of Ethics Spencer describes in more detail this "innate moral sense" and natural concern for the well-being of others. He believed that this sense had developed in human beings over time and that the ability to sympathize with others outside of one's immediately family did not exist in people until recently. This inner conscientiousness, he believed, should be the basis for laws. Spencer often criticized the religious institutions and doctrines of the time and did not see in them anything that could advance the human race. He argued that one could not adopt a belief in God or the divine without scientific proof of such a being. Thus, he dismissed the matter as unknowable and remained an agnostic throughout his life, focusing instead on the scientific examination of society. In a collection of essays entitled The Man versus the State, Spencer presents his view on politics based largely on "the law of equal freedom." Here, the priority is to ensure that individuals are allowed to act in their own best interest without government interference. Spencer believed in a "laissez-faire" government whose laws protect the liberty of individuals rather than infringing on them. The business of the government, he believed, should be allowing its individual citizens to act as they see fit. He thought it absurd that corrupt government officials imposed their beliefs on their citizens, being so arrogant as to think that they knew what was in the best interest of the people. Spencer attacked the practices of elected parliaments and representative governments who, elected by the majority, acted as tyrannies to the minority without the consent of any of their citizens. In all areas, Spencer said that the government should give way to private enterprises that were much more capable, efficient, and knowledgeable in their respective fields. He goes back to relying on natural law to create harmony and equilibrium within a society. Just as nature governs itself and automatically thrives without any outside interference, Spencer believed human society could operate in the same way. However, he still believed that governments must exist to protect the weak from the strong and to administer justice when wrongs are committed. Spencer’s works were widely read during his lifetime, and by 1869 he was able to support himself solely on the profit of book sales. Translations of his various works were made in German, Italian, Spanish, French, Russian, Japanese and Chinese, and he was offered honors and awards from all over Europe and North America. Spencer's political and economic philosophy, based on the "law of equal liberty," proved most useful for political conservatives, not only for its application towards the hierarchy of social classes but also for its conception of social justice which emphasized the responsibility of individuals for their nature and actions. Multiple American Supreme Court Justices supported his theories and applied them to their decisions by ruling in favor of corporations and preventing government interference in big business. However, it was not just conservatives who used Spencer’s theories to promote their views. Many socialists cited his notion of "survival of the fittest" to incite people toward class warfare, and anarchists applied his autonomy of the individual to their own beliefs. Spencer has been described as a quasi-anarchist as well as an outright anarchist although, in essence, Spencer's focus was to discourage government interference in economic and social developments. Spencer's influence across a large range of political opposites may seem to point to contradictory ideas within Spencer's writings. However, most of the difference is best understood as how different ideologies applied different aspects of Spencer's wide influence to defend their varying beliefs. Spencer's two main areas of influence were the scientific evolutionary ideas of "survival of the fittest" and his political ideas of liberalism. To Spencer, these ideas did not contradict. "Survival of the fittest" was understood to explain the perceived human progress from the Industrial Revolution to his day. Further, Spencer viewed the success of liberalism in reducing the power of the state as progress and evidence of evolution within human culture. He considered natural rights a concept through which survival of the fittest acted most effectively in human culture. Spencer's idea of the "survival of the fittest" also helped to shape Social Darwinism. However, during Spencer's lifetime the meaning of liberalism itself was beginning to refer less to classical liberalism, which promoted "laissez-faire" economics and decreased state power. It began to apply instead to progressive liberalism which favored an increase in the power and influence of the state. At this point, Spencer's belief in natural rights, natural law, and classical liberalism stopped matching his understood evidence for them in citing the progress of survival of the fittest to human civilization. It is also at this point where the followers of his ideas took opposite paths. Those that supported his understanding of linear progress and survival of the fittest looked positively at the increasing power of government as progress and rejected Spencer's concepts of natural rights and limited government. In the United States, Supreme Court Justice Oliver Wendell Holmes, Jr., for example, did not believe in a natural law limitation for the application of "survival of the fittest" to human civilization and supported the Eugenics movement. Those who supported Spencer's political writings, classical liberalism, or natural rights philosophy such as H.L. Mencken were opposed to the Eugenics movement even when it was politically popular. Most of the current supporters or defenders of Herbert Spencer, including classical liberals, anarchists, libertarians, and perhaps some conservatives do so for his political philosophy. Some may believe in Spencer's "survival of the fittest" within the confines of a natural rights philosophy, but others have rejected his ideas of linear progress and replaced them with the "paradigm shift" ideas of Thomas Kuhn. It should be noted that key communist leaders felt that Herbert Spencer's writings exposed all of the defects of capitalism. Spencer was heralded by American society's industrial elites including Henry Ford and Andrew Carnegie. Communists such as Lenin's mentor George Plekhanov emphasized that prior to reading Karl Marx, one needed to read Spencer to understand the depersonalized nature of capitalism. "On The Proper Sphere of Government" (1842) Retrieved March 30, 2014. Social Statics abridged version (1851) Retrieved March 11, 2008. The Development Hypothesis (1852) Retrieved September 14, 2008. The Philosophy of Style (1852) Retrieved September 14, 2008. System of Synthetic Philosophy (1860) Retrieved September 14, 2008. Education (1861) Retrieved March 11, 2008. The Data of Ethics (1879) Retrieved March 30, 2014. The Man Versus the State (1884) Retrieved March 30, 2014. The Principles of Ethics (1897) Retrieved March 30, 2014. An Autobiography (1904) Retrieved March 30, 2014.
v1 Life and Letters of Herbert Spencer by David Duncan (1908) Retrieved March 11, 2008.
v2 Life and Letters of Herbert Spencer by David Duncan (1908) Retrieved March 11, 2008. Herbert Spencer: An Estimate and Review by Josiah Royce (1904) Retrieved September 14, 2008. Lectures on the Ethics of T.H. Green, Mr. Herbert Spencer, and J. Martineau by Henry Sidgwick (1902) Retrieved September 14, 2008. A Few Words with Mr Herbert Spencer by Paul Lafargue (1884) Retrieved September 14, 2008. This page was last modified on 20 December 2017, at 15:14.